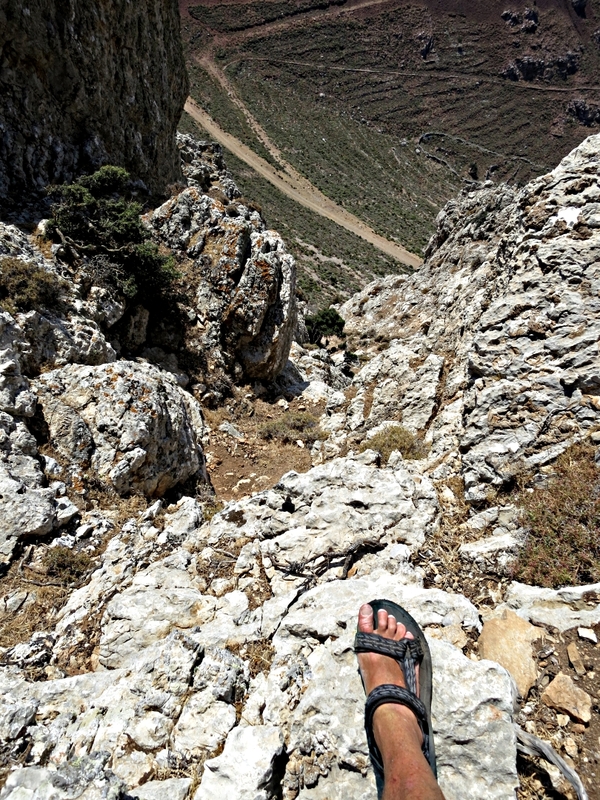 Not as dramatic as Vancouver to Whistler, or as long, but very enjoyable and on Tilos all done on foot. 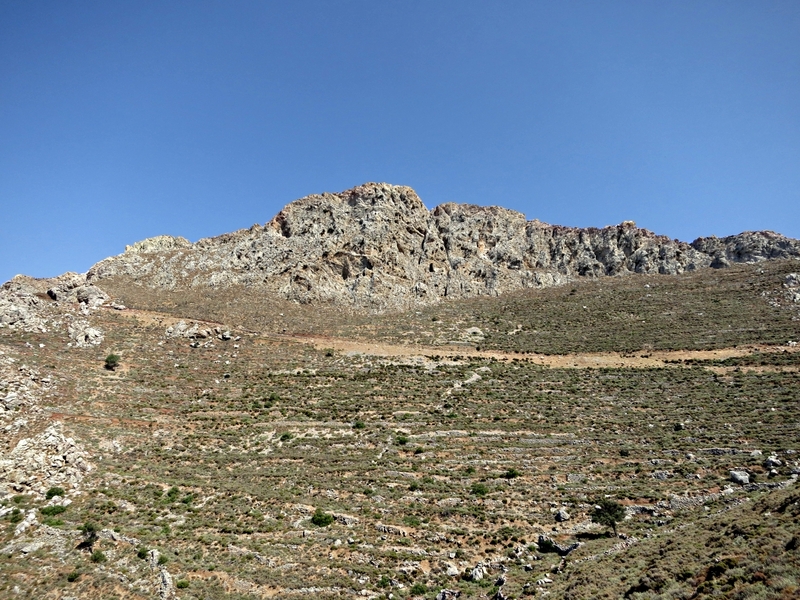 Livadia Bay is backed by a curve of mountains, in three main blocks each with its high point (obviously!! )and separated by cols. The mountains are not very high, from west to east (left to right in the photo below) Gherondas (371 metres), Thymadheri (360 metres) and Vounos (405 metres), each a minor challenge. None of them has a footpath to the top, they are very much ‘off piste’ but instead of nice powder-snow they are bare rock with flesh-ripping thorns scrub between. Three peaks, three walks from sea to sky and back again. First, Thymadheri. I had been up Thymadheri several times in the past as part of a circular walk. Though the lowest of the three it’s perhaps the most dramatic because it’s a vertical rocky crag which is probably why it has for many years been home to a pair of Bonelli’s Eagles. I headed there first, principally to renew acquaintance with the eagles, not that they ever seemed pleased to see me but drifted off to neighbouring crags as soon as I appeared with my camera. 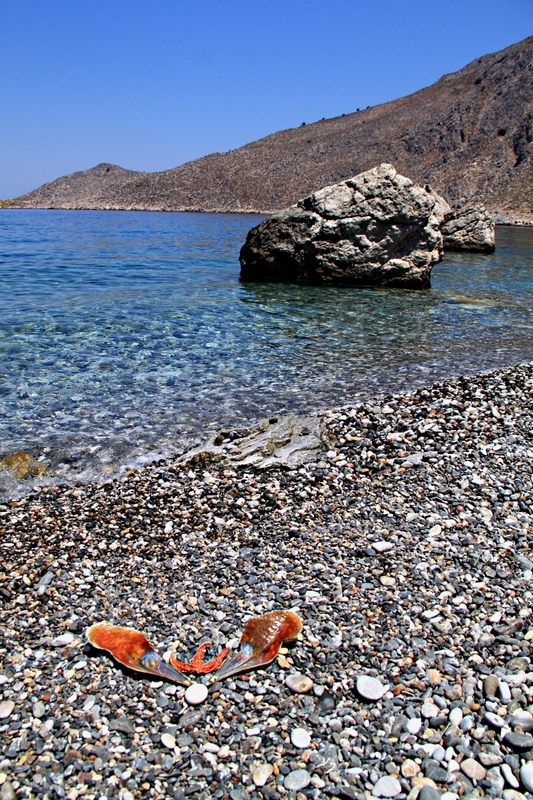 Livadia, despite lacking the administrative designation, is the main settlement on Tilos with over 2 kilometres of curving pebble beach around the bay. A nice easy introduction to the walk is a stroll round it to the furthest easterly point. The first kilometre is largely sunbed-and-umbrella-beach littered with a mixture of bodies beautiful, ageing rotundity and a wide range in between. The second section has small groups on towels or plastic chairs mostly in the shade of tamarisk trees, the ‘locals’ beach, again with a mixture of bodies beautiful, ageing rotundity, etc. The final section is narrow and deserted save for the odd guy standing knee-deep in the water fishing. 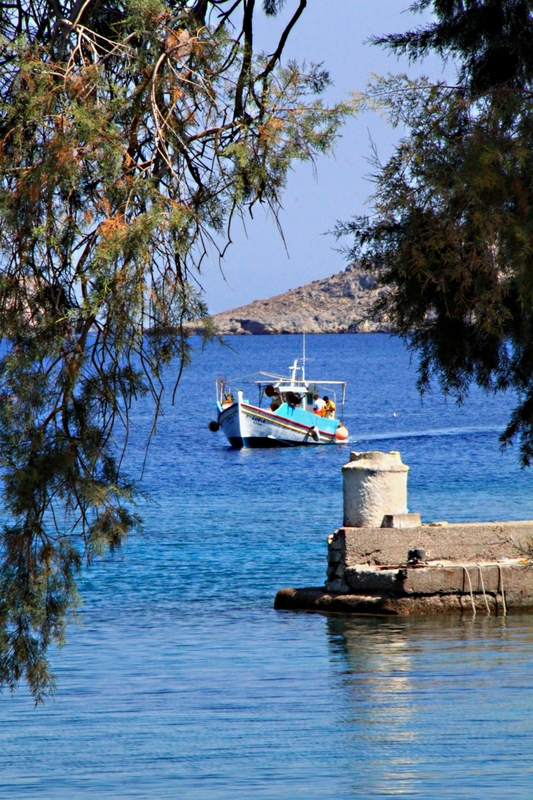 The restaurant/taverna/hotel and the small mediaeval harbour of Agios Stephanos at the far eastern end of the bay is a remarkably tranquil place to sit with a frappé and watch a miniscule segment of the world drift by … and wonder if you really want to wander any further. However, always driven by the urge to move on, the next target is the tiny beach called Δεσπότη το Νερό, which I think translates as ‘Lord of the Water’, at the bottom of a long steep descent from the main coastal path. The beach is pleasant enough for a swim and a laze but the great joy of it is the freshwater spring (hence the name) which gushes straight out of the mountain, sweet to drink and gorgeous to stick your head under for an amazingly refreshing shower. Some think it’s masochistic but I love to fill my sun hat, with the water and then put it on my head. Euphoric!! Feel the cold, refreshing tingling down your neck and your body. Again and Again. Enough of that. Back to the walk. It’s a bit of a pull from there back up to the main path and then backtrack slightly before upwards again to join a high-level EU funded track, bulldozed for who knows what reason, which passes through a col between Thymadheri and Vounos. But finally, a drop down, all the while casting wistful looks over my shoulder at the mountain, and another swim this time from Livadia Beach, at the non-sunbed end of course. 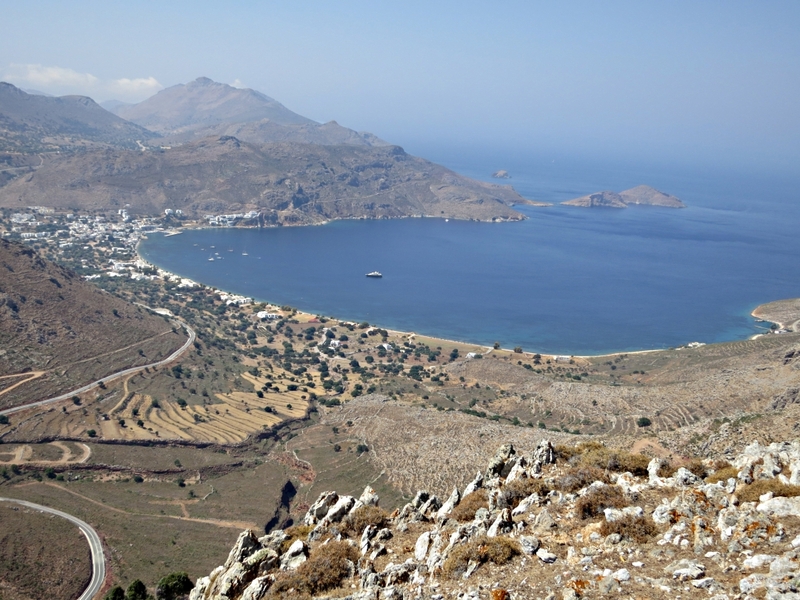 This entry was posted in Greece, Landscape, Mountains, Nature and tagged Agios Stephanos, Bonelli's eagles, Despoti to Nero, eagles, fishing, freshwater springs, hiking, Δεσπότη το Νερό, Livadia, Livadia Bay, sea to sky, squid, Tilos, Tilos Coast Path. Bookmark the permalink.